GildedNails: Nars Zulu Giveaway Winner and 500 Follower Sneak Peek! 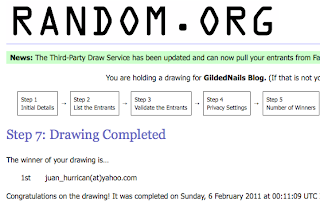 Nars Zulu Giveaway Winner and 500 Follower Sneak Peek! Hi everyone! Hope you are all having a fabulous weekend! I finally have the winner of my NARS Zulu Giveaway! Congratulations Halifax from Sparkled Beauty! I have sent you an email so please get back to me with your address details asap! Thanks to everyone who entered! And since I'm a bit of a giveaway maniac and I am fast approaching 500 followers, I thought I'd show you a sneak peek of some of the goodies that I will be giving away when I reach that milestone! Some of these goodies have been donated by the lovely people at OPI, Orly and Vivid Nails (Nfu Oh) and I am still waiting on more goodies from Le Beauty, China Glaze and Color Club! Plus I have added some other bits and pieces that I bought myself. This is set to be my biggest giveaway to date and as soon as I click over to 500 followers, I'll open it up for everyone to enter! could not have gone to a sweeter person! Thank you for organizing another GA!! Congrats! Im looking foward to this! ^^ My next giveaway is going to be awesome! I can't wait to post it!